Click the above for information on this book. Click here or the book cover picture above to see PDF which includes all of the book (Title Page, Table of Contents, Section II (History of the First Amendment), Epilogue, Bibliography, and Index) except the INTRODUCTION and Section I. Available from Amazon in both paperback and Kindle. Quickest way to receive the book since all booksellers order from Xulon. 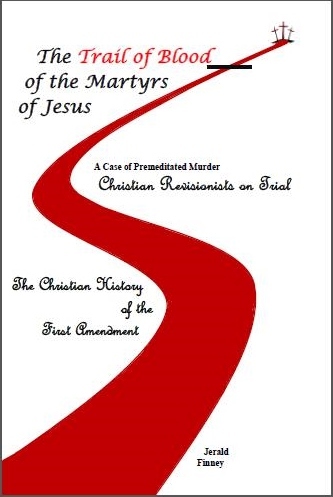 Click here to see PDF which includes all of the book (Title Page, Table of Contents, Section II (History of the First Amendment), Epilogue, Bibliography, and Index) except the INTRODUCTION and Section I. 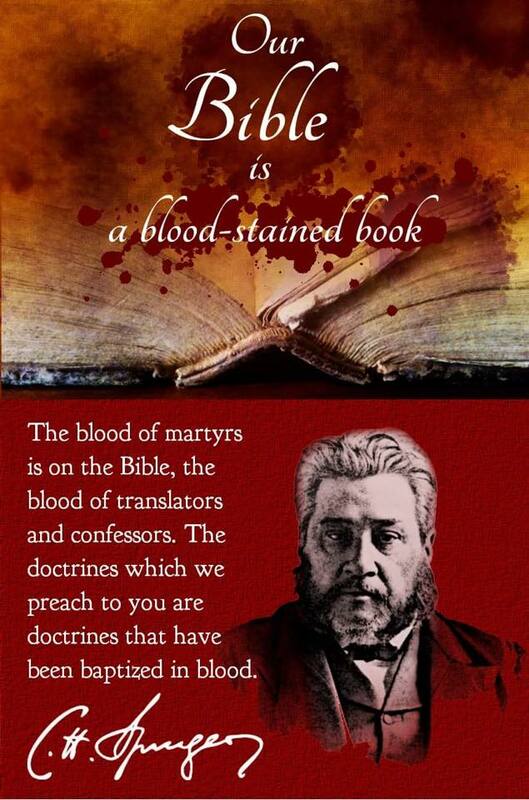 See the Bibliography for list of resources which prove the assertions in The Trail of Blood of the Martyrs of Jesus. The Inquisition was set up formally in the 13th century to exercise control over all people within the reach of the Roman Catholic Church. (Inquisition means interrogation, investigation.) Eventually it extended to practically every corner of Europe and beyond to the territories conquered by Spain and other Catholic colonizing nations. The Inquisition was Rome’s apparatus to enforce her laws. It was illegal to disagree with Rome’s doctrines and practices, to preach any doctrine other than Rome’s, and to translate or read the Bible in the common languages without permission from the Catholic authorities. Those who disobeyed were arrested, tortured, robbed of their possessions, and put to death. It was during the reign of Pope Innocent III (1198-1216) that the Roman Catholic Inquisition became an organized, systematic institution. “Religious persecution assumed new forms. 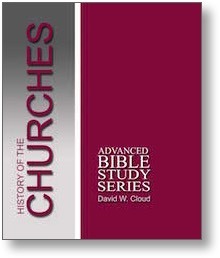 The Age of Innocent was one of terror to all liberty of thought and worship” (William Blackburn, History of the Christian Church from Its Origin, p. 307). Pope Gregory IX (1227-1241) expanded the Inquisition. He was The nephew of Innocent III. During the reign of Innocent, the Inquisition had begun to be formed into a brutal, all-pervading mechanism. It was only left for Gregory to expand it to all Catholic countries and to “fine tune” its barbarities. In 1233, Pope Gregory issued two papal bulls appointing the Dominicans and the Franciscans as Inquisitors and giving them authority to search out and destroy separatist Christians wherever they were found. The Dominicans and the Franciscans set up a spy network and oversaw the work of the Inquisition. The popes issued many papal bulls promising great rewards to those who joined their inquisition against heretics. The one issued by Pope Gregory IX in 1238 promised that if any person assisted the office of the Inquisition “heretics” the pope would “relax three years of the penance enjoined upon them,” and “if any persons shall die during the prosecution of that affair, we grant them a full pardon of all their sins” (Illustrations of Popery: The Mystery of Iniquity Unveiled, 1838, p. 388). The Inquisitors had authority to capture, try, and deliver up to death all that disagreed with Rome’s teaching. They had authority to proceed even against bishops if they thought they were not supportive of the Inquisition. – All public officials were obligated to give whatever assistance was required by the Inquisition. Kings and secular authorities were ordered to root out and destroy the Waldenses and all separatist Christians. – No one could interfere with the work of the Inquisitors. -All citizens from age 14 were sworn as spies of the Inquisition and were required to reveal all offenders. – The Inquisitors kept minute records and shared information with one another through a constant exchange of documents. The descriptions of known heretics who escaped or disappeared were sent throughout Europe. – Anyone who was traveling or was a foreigner was suspect. “A suspicious stranger would be observed and arrested; his birthplace would be ascertained, and as soon as swift messengers could traverse the intervening distance, full official documents as to his antecedents would be received from the Holy Office of his former home. … The net of the Inquisition extended everywhere, and no prey was too small to elude its meshes (Henry Lea, History of the Inquisition of the Middle Ages, unabridged, I, p. 396). – The priests in every town were at the disposal of the Inquisitors, and during the mass, they constantly warned the people to be on the lookout for heretics, threatening them with dire punishments for withholding information and promising eternal rewards for their assistance. – Spies were hired by the Inquisition in every area to observe everything that happened in the community, and special rewards were given for their success in rooting out a “heretic.” If anyone was under suspicion, spies were assigned to watch his every move in an attempt to discover any excuse to turn him over to the Inquisition. – When a suspected “heretic” was captured, every effort was made through torture to obtain the names of others. In this way “a single lucky capture and extorted confession would put the sleuth-hounds on the track of hundreds who deemed themselves secure, and each new victim added his circle of denunciations” (Henry Lea, The Inquisition of the Middle Ages). – The Inquisitors used all sorts of terrible forms of torture in an attempt to force its victims to confess. Their limbs were stretched on the rack. They were hung up by their hands, with their arms tied behind their back, wrenching their bones from their sockets. They were brought to near drowning by water torture. They were beaten and cut and burned. – The Inquisitors set up their own terrible prisons and could torture the “heretics” as they pleased. The cells were small, dark and gloomy. There was no heat in the winter and the prisoners had little or no clothing and usually no sheets or blankets. Often the prisoners were naked. When an inquisition prison was broken open during the days of Napoleon, all of the prisoners were found to be naked and filthy and many were insane. The prisoners were often chained close to the floor and could not escape the rats and other vermin that populated such filthy places. Food was meager and of very poor quality. There was usually no medical treatment. There were no visits by relatives or loved ones or anyone who could provide consolation or even the slightest word of cheer. In most of the prisons, the captives were required to keep absolute silence. Books and writing utensils were usually not allowed. – Those who were caught by the Inquisition had no legal counsel or recourse and were entirely at the mercy of the Inquisitors. – The person who was arrested did not have even the right to confront his accuser or even to know who the accuser was. – Anyone, no matter how dishonest, or wicked could bring an accusation against a citizen to have him imprisoned by the Inquisition and his goods confiscated. – If someone attempted to come to the aid of one who was in the hands of the inquisitors, he, too, became the object of persecution. Such a person was excommunicated and could be charged with heresy and put to death. – Anyone, no matter how powerful, could be charged with heresy by the Inquisitors. – The Inquisitors could confiscate property almost at will, and countless persons were falsely charged with heresy just so the Inquisitors and their secular collaborators could greedily confiscate their goods. – Even if a “heretic” died before being caught, the Inquisitors could condemn them and confiscate his money and property, thus robbing the children or grandchildren of any inheritance, even if the children themselves were good Roman Catholics. – Even good Roman Catholics were arrested by the Inquisition upon suspicion of ideas that were different from Rome’s doctrine. Those who stated unacceptable opinions even privately to friends and relatives were in danger of being condemned. – Censorship was a major part of the Inquisition. Every book had to be approved by the Catholic censors. To be caught with an unapproved book put one in danger of falling into the hands of the Inquisition. – One of the many punishments used against the Bible-believing Christians of the Middle Ages was to condemn them to labor in the galleys. These were war ships powered by huge oars driven by slaves who were chained together and treated in a most inhumane fashion. It was a horrible punishment and often constituted a death sentence. – The Catholic Inquisition did not formally end until the 19th century. In the early 1800s, Napoleon abolished the Catholic Inquisition in some places and freed people from prisons. When the Inquisition prison was opened in Toldeo, Spain, by French General Lasalle, the following is what was found: Graves seemed to open, and pale figures like ghosts issued from dungeons which emitted a sepulchral odour. Bushy beards hanging down over the breast, and nails grown like birds claws, disfigured the skeletons, who with labouring bosoms inhaled, for the first time for a long series of years, the fresh air. Many of them were reduced to cripples, the head inclined forward, and the arms and hands hanging down, rigid and helpless: they had been confined in dens so low they could not rise up in them. … in spite of all the care of the surgeons, many of them expired the same day. The light of the sun made a particularly painful impression on the optic nerve” (H. Grattan Guinness, The Approaching End of the Age, 1878, pp. 205-207). Doubting Thomas (Aquinas) on Private and Public Killing (111417) by Christopher O. Tollefsen is College of Arts and Sciences Distinguished Professor of Philosophy at the University of South Carolina. When religion (Catholicism, Protestantism, Islam, Hinduism, etc.) and its adherents persecute true believers, they actually persecute Christ. Paul the apostle persecuted “Christians” but Jesus said to him at his conversion, “Saul, Saul, why persecutest thou me?” (Acts 9.4, 22.7, 26.14). These religions and their adherents actually believe that that they are serving God when they kill those true believes whom they label as heretics. (John 16.2). Article: The Dark Side of the Reformation, by Joseph Farah (October 11, 2017). This article tells the truth about Jewish persecution by Luther and Calvin, but fails to point out that the true New Testament Churches and Christians (who believed in separation of church and state, believer’s baptism, etc.) were also persecuted by Protestants who, like their harlot mother, believed in union of church and state. The article still indicates that these persecutors were carrying out the mission of God – Lies! No follower of Christ persecutes others because of their religious beliefs. The theologies of Luther and Calvin were still highly heretical at best. Joseph Farah still teaches that thre First Amendment does not separate church and state, another Catholic and Protestant lie. The First Amendment does not separate God and state, nor does it require the state to operate under God, but it does separate church and state. To understand this, see the writings of Jerald Finney. See, for a good starting point, the short article “Is Separation of Church and State Found in the Constitution?“ The Trail of Blood of the Martyrs of Jesus fully explains this matter.